Winners will be announced in June! The Excellence Awards are presented annually by the Florida Stormwater Association to public sector member organizations who have demonstrated a high level of distinction in stormwater programs and/or projects. View previous award winners. Program Excellence - Sustained demonstration of excellence in a stormwater department or division, as evidenced by ongoing and frequent development and implementation of innovative projects, a stable staff or adequate funding, etc. Project Excellence - Successful implementation or outstanding innovations by a public entity in one or more areas of stormwater management projects, including stormwater utilities, permit compliance, intergovernmental coordination, water quality improvement, public education, illicit discharge detection, etc. To recognize outstanding Stormwater Programs and Projects in the profession of stormwater management, and the benefit they provide to the environment and local citizenry. The Membership Committee reviews and ranks nominations. The Executive Committee reviews the recommendations and determines the final award winners. 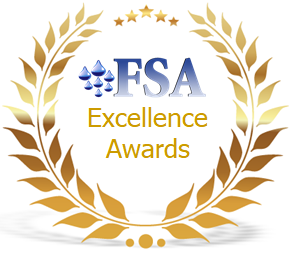 Announcements of the winning submissions and presentations of the awards will be made at the FSA Annual Conference in June. Award winners will be given the opportunity to make a presentation on their project or program at the Winter Conference in December. Cooperative partnerships are eligible for submission; however, only one award will be provided for each winning nomination. We are now accepting nominations! Click on the "Nominate Now" button above and follow the prompts. The form and supporting materials must be submitted to FSA by the deadline indicated. Only FSA public sector members are eligible to receive awards. Jurisdictions that have won previously may apply again.